UFO REPORTS: NOCTURNAL LIGHTS & DAYLIGHT DISCS OVER NEGROS OCCIDENTAL. . .
NEGROS OCCIDENTAL - one of the six Provinces comprising the Western Visayas region, has also been long known as the "sugarlandia", the agro-industrial center that has also earned the reputation as the "sugar bowl" of the Philippines. The Province is one of the two located in the island of Negros- the fourth largest in the whole archipelagic nation of 7,107 islands. 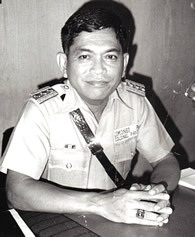 Beginning in the first quarter of 1979, the Province became one of the areas in the country that played host to a variety of sighting incidents ranging from the puzzling "Nocturnal Lights" to the more well-documented bizarre case of a "Close Encounter of the Third Kind" (CE-3) involving a lone witness in the City of Talisay. UFOs Sighted Over Negros. . .? Provl Commander orders Investigation on alleged "UFO Landing". . .
Col. Paterno Lomongo, Constabulary Provincial Commander, has directed PC elements in Nortehrn Negros Occidental to verify the reported "landing" of an unidentified flying object (UFO) in a barangay in the Carapale Valley in Calatrava. Lomongo told Philippine News Agency (PNA) that he had informed Col. Buenaventura Casenas, Region-6 PC-INP commander, regarding the sighting of UFOs in Calatrava (town) and some northern Negros Occidental towns last April 1 and 2. The big stir, however, was created on April 19 when the population of Bacolod City, Talisay, Silay City, and E.B. Magalona reported having seen a "Mother Ship" which later spewed out smaller UFOs which it led in " V " formation flying toward the mountain. The place where the alleged landing occurred is part of the logged over area which formed previously part of the Insular Lumber Company-Philippnes (used to be the largest integrated hard-mill lumber Company in the world) concession. Most of those who had witnessed the flight of unidentified flying objects (UFO) over Bacolod City and Talisay last April 19 had shown initial hesitance to identify themselves until they heard that policemen had also seen the puzzling phenomenon. Among those who positively saw the UFOs was my own father, FULGENCIO ESPINA, who reached Bacolod about six in the morning of Thursday, April 19. He was with twenty others who were amazed by what they had seen on their way to Bacolod. They did not know that more than a hundred other persons in the town of Talisay, some seven kilometers north of Bacolod, had also seen the "flying object" that brought many others to the streets. Some, like the market vendors and jeepney drivers at the Talisay Public Market, scrambled for safety, even as they peeped at the fiery phenomenon which hovered over Bacolod's suburban town and pulsated with a variety of colored flames that streaked out of its underbelly. Later, the witnesses recalled, the oval-shaped flying object spewed out colored flames from its underbelly followed by the emergence of about thirty smaller circular objects. These, displaying similar characteristics as the "mother ship" the other flying objects arranged themselves in a "vee" and flew off with the big one leading them toward the earth. These were the ones that attracted the attention of the bus passengers somewhere off Silay City. Most of those who had seen the object were almost unanimous in their observation that they hear "no sound", unlike in an airplane. "At first we thought it was an airplane. But then, it hovered over some sugarcane fields and flashed off and on with vari-colored flames," my father told our family. Almost simultaneously that Thursday morning, members of a Talisay Integrated National Police (INP) patrol, headed by SGT. ROGELIO JAMISON, rushed out of the police station to gawk at the "unidentified flying object". Over at the Talisay town plaza, a group of about twenty early morning joggers, led by GEORGE DONESA, also stopped running and gazed at the aerial phenomenon which had sent vendors and jeepney drivers either into the streets fronting the public market or scampering for safety. Over at the Talisay-Silay Milling Company, dozens more rushed out of their homes to gaze at the hovering "multi-colored fiery aerial craft". They had been awakened by the screams of NELLIE MALVAS, the 25-year old cafeteria operator, who became alarmed when what she had thought was an airplane hovered over the sugar mill. It turned out that on April 24, several jeepney drivers plying the Barangay Montevista-Bacolod poblacion route had also witnessed the smae "unidentified flying object" with multi-colored lights' hover over the People's Homesite & Housing Corporation (PHHC). What they were, nobody could say. Accoridng to INP Station Commander FELIX DE ASIS, "they saw a flying object with blazing flames of changing colors and later, saw several more emerging from the hovering craft, then split themselves up into "vee" formation and few off in uniform flight. He had forwarded his official report to the Constabulary Headquarters in Bacolod City. MRS. FLORA MARQUEZ said she, her husband Jose, and their 20-year old son Noel, had also seen these object hovering near the Bacolod-Murcia Milling Company. ATTY. MYRNA PAGSUBERON of BM-AMCI also recounted having seen a flying disc with multi-colored lights flying over Tangub area last April 25. Asked how she felt during the sighting, she answered simply, "awed". According to her, her neighborhood in Tangub were out on the streets to watch the flying discs flying off into the horizon. Previous to her sighting, she reported taht on April 23, the whole neighborhood was awakened and ran off to the streets between nine to ten in the evening after hearing motor sounds louder than the jet's coming and going over their houses. "Even my grandmother had to go out to the streets because the sounds made our house vibrate, " she said. However, she was not able to see anything that night, while her other neighbors, who were looking toward the sea, saw flying discs with multi-colored lights. 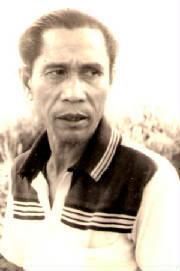 PLACIDO BAUTISTA, subsector commander of the Barangay Auxilliary Police in Hacienda Magkurao near Mt. Mandalagan, also reported to INP Station Commander De Asis that farmhands plowing the fields left their carabaos when they saw the "Bulalakao".. But they were amazed at the type of the "Bulalakao" thaey saw which performed almost exactly the same way described by the TASIMICO and poblacion witnesses. "Bulalakao" is a legendary flaming bird, a familiar object to Ilonggo folk tales. Most of the witnesses agreed that the flying object was either saucer or cigar-shaped and exuding multi-colored lights, very fast and suddenly remaining stationary, then northwards in V-shaped formation. "We really have no idea what those were, but with so many reliable witnesses, we had to submit an official report to higher Headquarters," De Asis said. It was April of 1979 when my mother and niece went with me to San Carlos City. At about 3:00 in the morning when my attention was called by my niece Orvilla Jose that a bright starlike object was moving fast toward our direction, so I let the driver of our vehicle to stop and observe unusual phenomenon. At around 60 degree angle of elevation I can clearly see the object as not one but hundreds of them travelling from south to north passing our location. Theyu were glowing in an amber-like iron as big as a man's fist. I knew they were far far away from us. My first impression was meteors, but I was in doubt because they travelled in PARALLEL to the Earth's surface. Had I brought with me a camera I could have shown a concrete evidence. Until now I could still picture this unusual happening in the sky but I could not tell what were they.